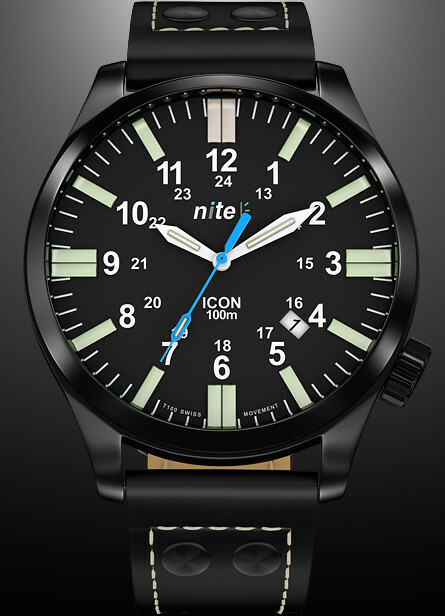 To be more precise it is actually the Nite Icon 201L T100 and certainly lives up to it’s name as a watch you can definitely see in the dark! 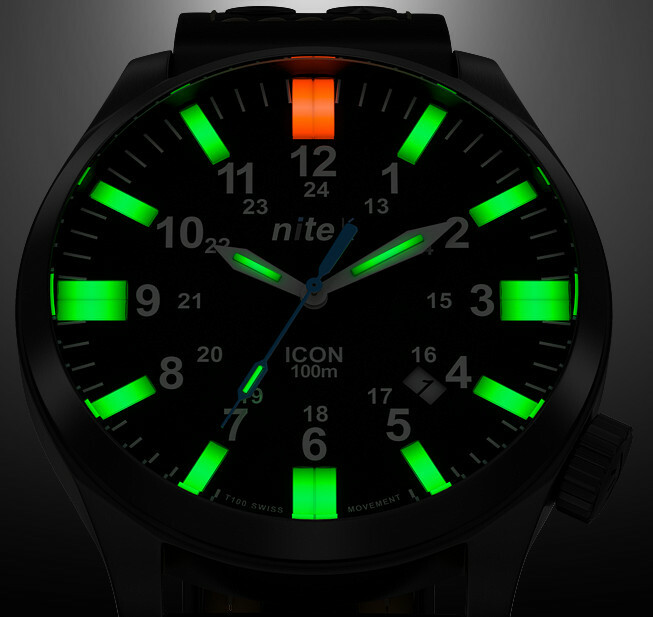 Nite Icon 201L T100 Tritium. As many of you will know I love my Tritium watches, and have a good few of them today and none have ever let me down. In fact I when I used to be on “nights” in military service for 6 months at a time my Tritium light source models were an absolute must. 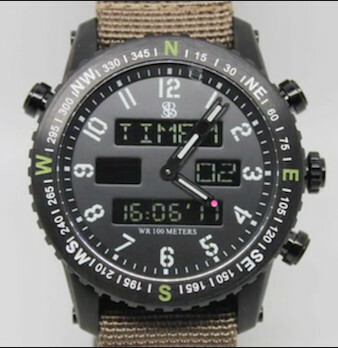 In fact since those day Tritium models apart from some small cosmetic changes have hardly changed ever since GTS Light Source was first introduced, such as the colors available for example or in the basic watch model design. I’ve always liked Nite watches but never actually owned one, mostly because I preferred other case/watch/dial designs from other Brands and also as price was an issue. However the Nite 201L T100 has the advantage of an updated GTS capability with the altered light source construction feature – flattened Tritium tubes. These spread the light more evenly than the more common round tube design and do away with any surrounding reflector ideas of older design watches. Flat tube Tritium at it’s very best. In fact the tubes look very like traditional dial markers but at night appear much brighter, yet at the same time much easier on the eye. There are in fact the more traditional round Tubes on the Hour, Minute and center Seconds hands, where they are ideal with their narrow light line acting more as pointers. This particular model is also very well specified and with some thought gone into regarding the choice of materials etc. The case is a decent sized 44 mm diameter with a good dial diameter of 38 mm and overall though the case is a fairly substantial 12.1 mm depth. 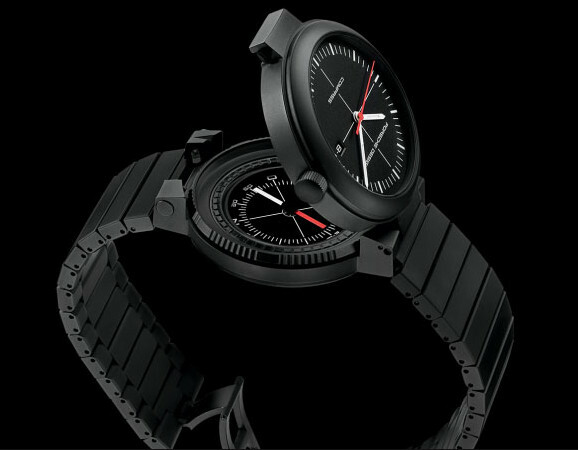 It is constructed of 316 Stainless Steel in black PVD and uses K1 Mineral Crystal with enhanced scratch resistance and hardness plus the advantage of Triple Anti-reflection inner coatings, so clarity is very, very good indeed. It is also fairly light weight at 80 g, has a decent sized Screw down Crown @4 and a Water Resistance of 30 ATM or 100 m. Incidentally the screw back has Nitrile Gasket/seals which are manufactured to withstand -40ºC to +60ºC so should last a long time. Movement wise Nite have gone for a sensible choice in the Swiss Ronda Quartz 515, which has a Date window between 4 & 5 and a Battery life of between 3 and 4 years. The price direct from Nite for this strapped model is £320 here in the UK, though as I often do I’d probably have an silicon/rubber deployment one as an alternative. Easy to fit of course as this case has conventional spring bar fittings. I tend to avoid steel bracelets these days as invariably they’re heavier than the watch and I don’t need that (and more expensive). 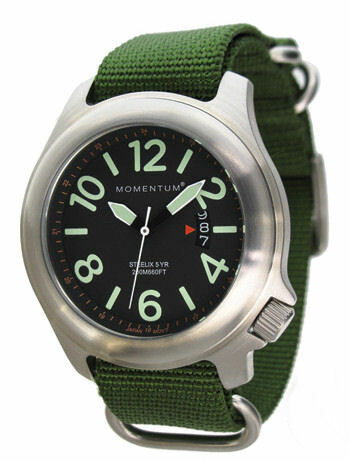 The higher price Point is maybe at the top end for a Tritium model, as personally I think high price & practicality could be viewed as a contradiction in terms – but the Icon 201L T100 with it’s considerable advantage of the flat/tube illumination, is definitely worth it and represents very good value. I’d go further and say that if you’re considering a watch for night use and certainly if you are involved in night work, then in my opinion for what it’s worth, it’s probably one of the best options available today. 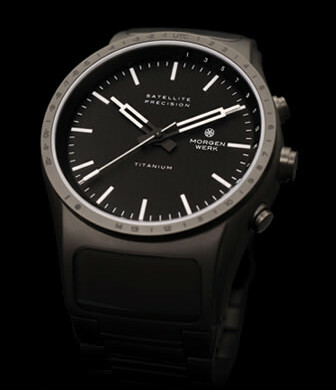 Addendum – I note they now have a polycarbonate cased version of the Nite watch – the Hawk. But unfortunately it has a much larger diameter case, which kills it for me personally. Why the larger case I don’t know, but what a shame as it really competed so well against the Casio range of G-Shocks, which of course also tend to have in the main an over large case for me. So the Nite 201L T100 model will still be the model I’ll probably end up with in my collection. I’ve never had many Italian watches in all the years of collecting, yet with the innate Italian flair for design I’ve often wondered why I didn’t own one. It’s not as if the quality is any less good than Swiss watches as indeed many of the Italian brands either manufacture in Switzerland or use Swiss movements anyway. Maybe it’s the premise, right or wrong, that Italian design and watches don’t go together as well as perhaps shoes or clothes or that their particular slant on watch design never really did it for me. But of course and as always, these perceptions change and things move on and so it was and is with this particular model from Carlo Ferrara – the Regulator Classic. Perhaps the whole concept of the “vertical elliptical dials” which fascinate and yet don’t detract one iota from either the readability, or indeed the clarity of the dial. It looks completely different to most other dial layouts and fundamentally it’s like it is this owing to it’s intriguing technical function rather than just an odd dial. The wonderful design element of this watch is in it’s technical movement set up and the use of a vertical linear drive chain. The Classic features a Swiss Automatic Cal.2892.2 movement and the stainless steel case measures just 39 mm which is such a sensible size, mineral glass, a magnifier Date window @6, centre seconds hand and 5 ATM Water Resistance and a very nice stainless deployment bracelet. It’s also available in quite a few different dial layouts based on the same elliptical premise, and all of them are interesting in their our individual manner. I know I’ve seen one like this but with a yellow dial – and it’s awesome! So an Italian model at last for me and one that’s certainly different – and perhaps I’ll be having another look at Italian design after all . . . .
As I already own and like very much my St. Moritz Momentum watch – the Format 4, I remember that there was another couple of their models that attracted me almost as much. At the time I was after an Ana/Digi, so the Format 4 was ideal, but the other two models had a practical aspect to them that I found refreshing. Momentum Steelix – a Daily beater if ever I saw one! The first is the Momentum Steelix which is a solid stainless steel, very well made model that has “daily beater” written all over it. 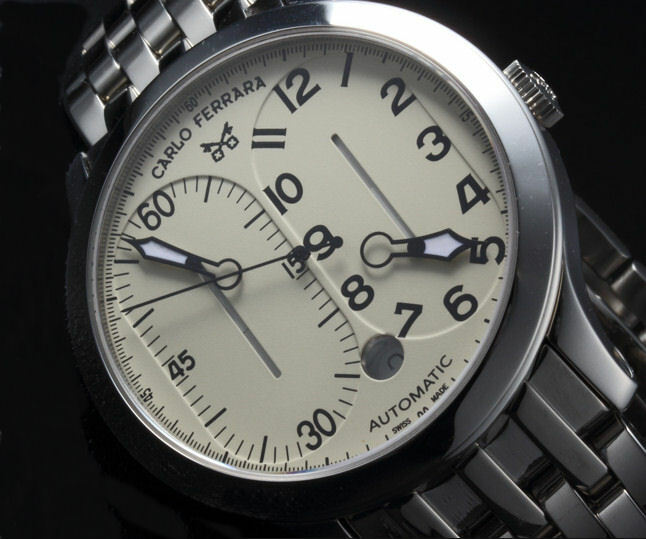 Great clear dial layout with good luminous broad hands and numerals. A triple Date window (which I’ve always liked) @3 and a decent sized screw down crown with 200 m Water resistance means you can take this virtually anywhere. In fact it’ll survive the trip even if you don’t! The second model that caught my attention is the Vortech Alarm GMT, which is ideal as a travelers watch, owing to the neat GMT pointer that you simply set as your Home Time and then adjust the hands to your destination time – what could be easier. 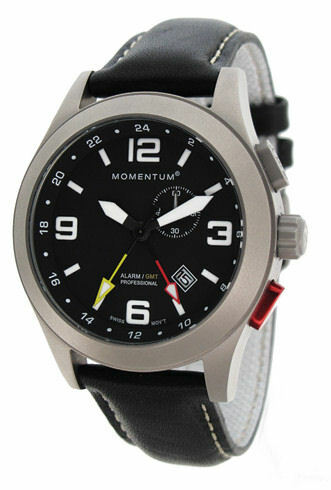 Momentum Vortech GMT, Alarm model in Titanium. The yellow GMT pointer tracks your Home Time, targets the outer 24hr index and it’s what I call a runner – in other words it’s set by a constant push on the top push button, which motors the GMT pointer around the dial to wherever you want. Neat and as I say a great travel watch without over complication and is both noticeable and yet unobtrusive too – and that’s clever. The red pointer is for the Alarm and is easy to set using the Crown to set the position and the lower red push button to set ON/OFF. The information says it’s a particularly loud Alarm (having a built in resonator?) but I really can’t comment, as I have a slight deafness these days and rarely if ever hear these things anyway! The Crown basically sets the Hour and Minutes Time, the Date and the Alarm time, so the operational mechanics are pretty simple and easy to remember. I also note that Momentum have instructional videos online for these so what could be easier than that. This model like the Steelix is also a tough watch, this time with a solid Titanium case at 44 mm wide and barely 12 mm height and yet is only 53 mm lug to lug which means small wrists wearing is OK. The strap is substantial at 22 mm wide so is proportional to the case and is available in a variety of NATO strap options and colors. 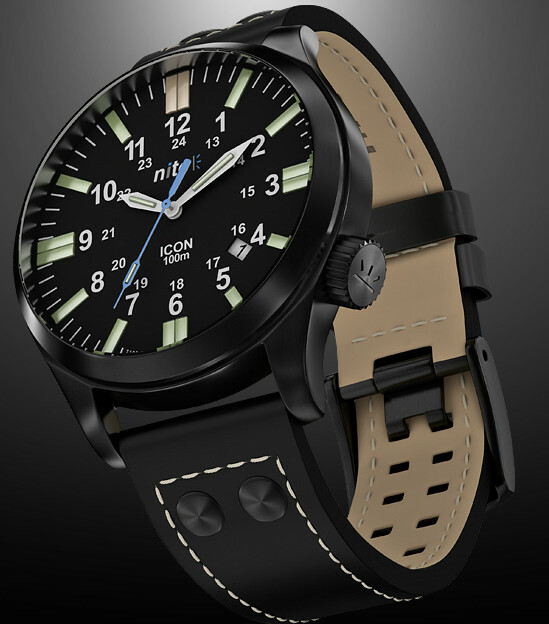 There’s also a Low Battery indicator (battery life is approx 5 yrs) and it has Grade A Super-luminova hands and dial detail so is a great night performer. A 100 m Water Resistance also means swimming pools are no problem at all. Currently the Steelix model (around£70) and the Vortech GMT (around £170) appear to be available here in the UK, which pleases me no end as there’s no question about it – these are my kind of watches. Most of their range is available HERE in the UK. I had a real fixation a while ago about “compass” watches and I got myself quite a few at the time, though after my fad wore off, I got rid of most of them, except for a couple of favorites. But it certainly got me thinking of just how many weird and wonderful “compass” creations are out there – and this time I feature analog only models and there are lots of ’em . . . . .
It’s also fair to say that most of them don’t have much to do with accuracy, except in the loosest sense that is, which is why the old schoolboy technique using an analog faced watch is probably as good as any for getting the basic direction. Anyway here’s a selection of the weird and the wonderful – mostly in the lower price bracket (except for the Porsche!) – of course I like it! I hasten to add that I do not vouch for any of the models featured here (except the last one, which I own) as I suspect the really cheap ones have all sorts of issues, but looks are something else. I have even found some where the compass doesn’t do anything but “look” like a compass – Wow! – and I thought those days were long gone! 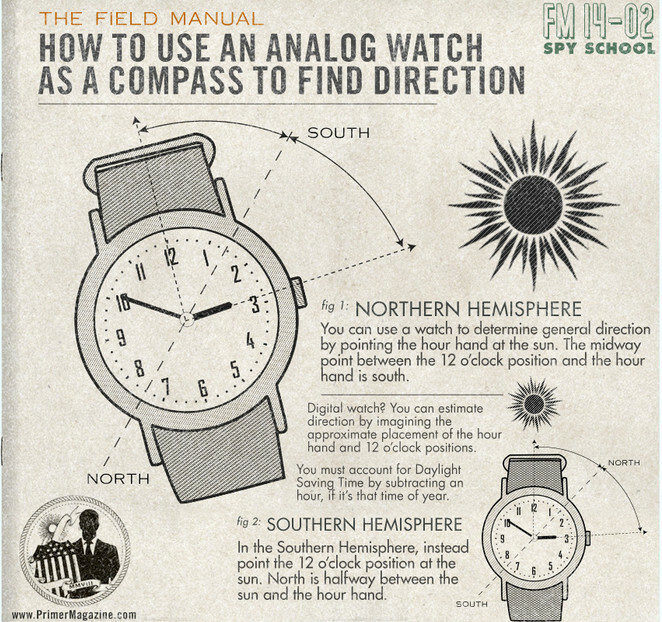 And there’s something about the old schoolboy or often called “spy school” method of finding North and South on your average analog handed watch. 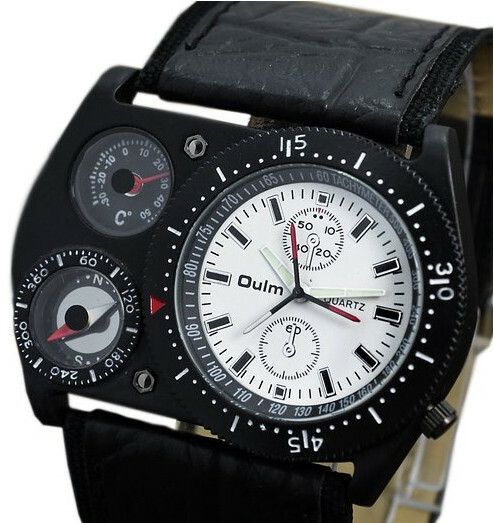 Some watches even call themselves “compass watches” because they have a movable bezel with the cardinal points and degrees marked around the perimeter. 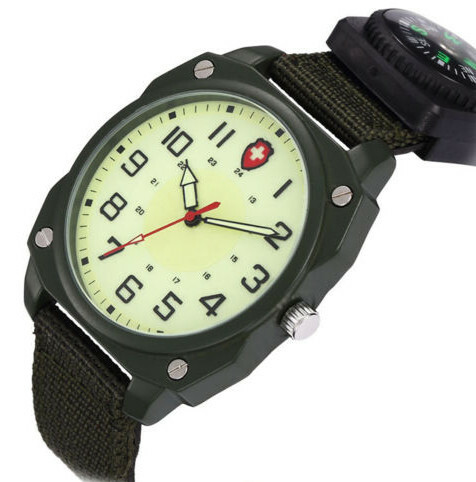 Cheating perhaps – but so is the watch in this case – a lookalike Swiss Army from China. A bit of a cheat perhaps, but if you know your sundial method, then these can be as “accurate” as some digital compass models I’ve seen and at considerably more expenditure. I kid you not! I particularly like the old method of using a small button liquid filled compass and have it attached to your watch strap – I mean what could be easier than that. The beauty of that of course is that you can stick it on any watch you care to be wearing at the time – easy peasy! full graduation one at that, semi built in and hidden away until required. I like the watch, but not the price at around 5000 Euros! Still you get a Titanium cased and beautifully built piece of kit with a Sellita SW300 automatic movement, lots of definition and dial clarity and more James Bond than Bond himself! The Retowerk features a disk rotor display coupled to an ETA 2824 Automatic Swiss movement, with 45mm diameter and a 200m Water Resistance, though the compass is a little low tech perched on the top. Interesting concept though and the more I see it, the more I quite like it. The Timex of course is a bit of an old favourite today, IF you can read it, which I always found to be the issue (goes to prove – NEVER believe the online images). The clarity of the dial figuring always to me at least seems to disappear into the background clutter and so much of the indices and so on were reflective. However I understand the later models are improved? but function wise the hands lining up as a pointer is certainly a classic compass idea – but as I say – IF you can read ’em! My last featured one on this is the Kickstarter promotion job, which I featured once before – The Smith & Bradley AR15 which features digital displays and analog compass set up. Here in compass mode the Minute Hand points to true North and the Hour hand shows your current heading – which to my mind is a really useful compass function and maybe even actually practical! Compass mode – Hands become True North pointer. The digital display indicates angle in degrees between the 12 o’clock and the True North pointer. Declination can be set in menu. 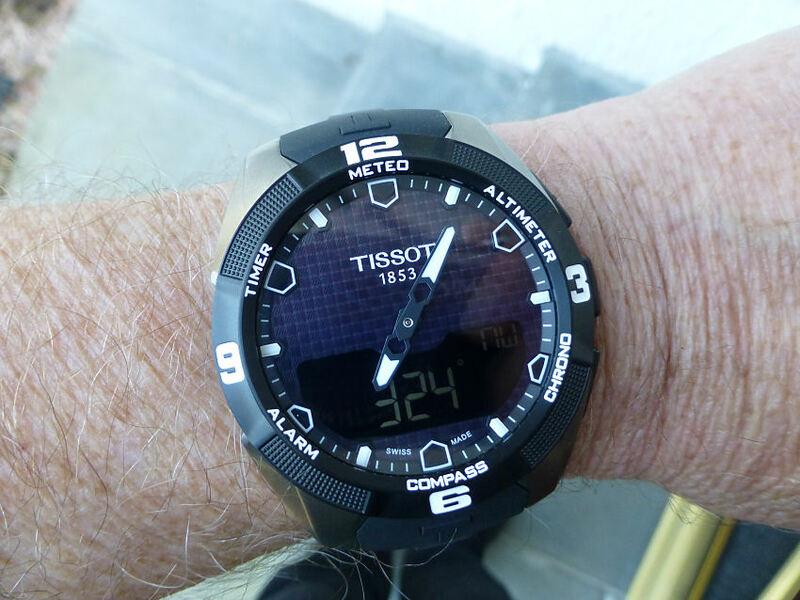 Personally though, at the moment at any rate, I’m sticking to my wonderful Tissot Solar Touch Compass (Altimeter, Timer, Meteo, Alarm & and everything else it seems), a model I’ve always wanted and bought myself as a present to me, some time ago. It doesn’t disappoint and I’ve also just noticed looking at it that the weather (Meteo) is taking a turn for the BETTER! (this Tissot is great!). So brilliant! – it looks like the golf course beckons – so I know which direction I’m going in within the next couple of hours! Perhaps the ultimate GPS watch, but which sadly to my knowledge yet to make a proper appearance. 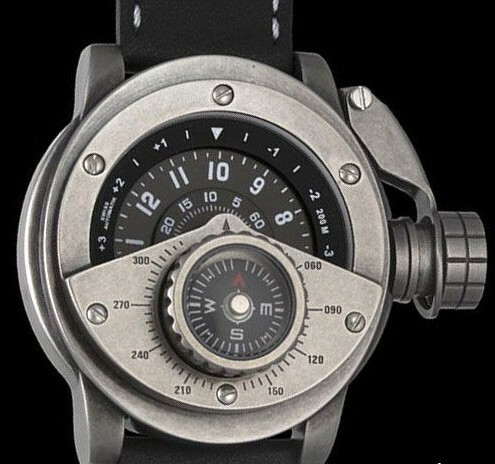 The German made Morgenwerk Precision Mk1 – GPS watch. 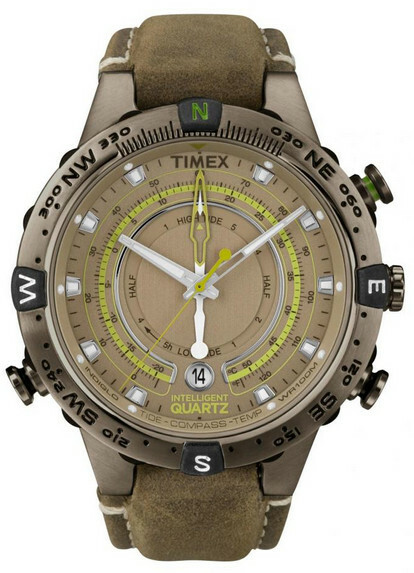 Understated full GPS function model with geographical co-ordinates, Compass, Altimeter etc. this is one VERY accurate watch. No longer using what could well be described as old technology Radio Control, but instead feeding off a multitude of satellites, this model apparently will manage a staggering accuracy of under 1 second – per month! Wherever you are in the world it will automatically display your Time Zone current time, day, date etc . A travelers dream. 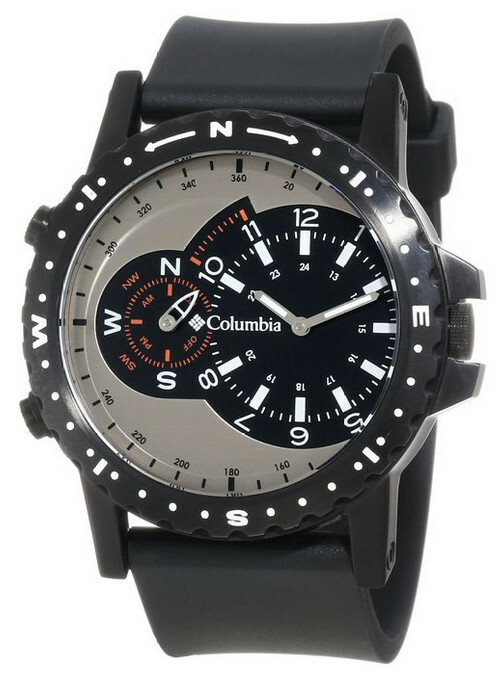 It’s under 14 mm depth, 44 mm diameter, Stainless Steel or Titanium cased, double anti-reflect coated Sapphire crystal, black dial with selectable discrete digital display. Of real importance and a major breakthrough has to be the Battery life, which is specially enhanced with a reserve of up to 18 months, assisted by the use of a self correcting thermo-compensated quartz movement allowing variation adjustments and allowing amazing accuracy. The actual GPS receiving system (between the lugs) is programmed to pick up 6 satellites and auto select the 3 with the strongest signals as the time source. The synchronization and reception process takes anywhere from 8 to 90 seconds. What I love is the fact that the watch is both understated and really easy to read and on wrist, seen to be just another “daily beater” albeit with great looks, but function wise does so much. It appears to me that if the brief functional detail is true, it will out perform just about anything else on the market. However the burning question is – where is it? The first intimation of it was way back in 2012 and the latest information I have is that their web site is currently in the build stage. One has to hope that once completed, the final watch details will be highlighted and models will be available for sale, especially as the price point quoted back in 2012 was from around $1100. And that could be a real winner. I hate to say the phrase “ultimate watch” – but it could well be – IF it hasn’t died a death along the way. And that would be a real shame . . . as it could be my final “grail”. BUT – and here I float down to earth after being initially blown away with all this technology. Yes it’s that old chestnut! Battery life! I mean let’s face it 18 month? Come on . . . . I was hoping for 10 years MINIMUM – with all this super tech stuff – it should be 18 years! Ah well back to reality . . . . . 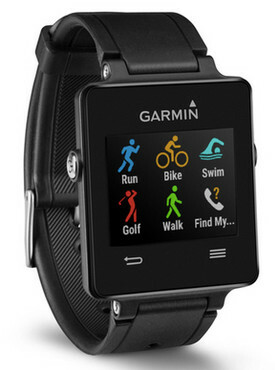 I suppose this model from Garmin really IS Smart – what with all the stuff it can do. Will definitely suit the “wannabe” fitness freak, Golfer, Swimmer, Runner and Biker and general Health Nut (heart monitoring and all that). 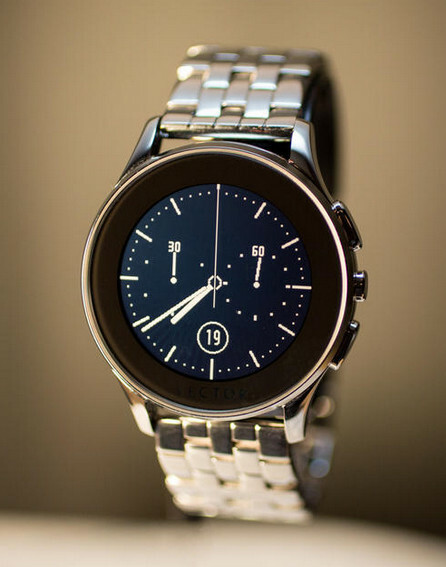 It also tells you the Time, pairs with your Smart Phone for calls, texts and emails, takes widgets from the ConnectIQ store, has watch face options and has a 3 week battery life in Watch Activity mode (10 hours golf mode). And it goes without saying this is a GPS enabled watch and it actually looks pretty good – and that’s praise indeed from me. It’s the slimness that does it as it’s just 8 mm, easy on the wrist and I would suppose if you’re involved in any of the activities described, then this is the only watch you will ever need. And I thought the Tom Tom Golfer watch was the business, but this is something else! And I don’t really like “Smart” watches either – but . . . Wow! In fact there’s so much in it I can’t even start to explain it all, except to say that it appears that Smart and GPS are here – perhaps to stay AND at a price that is actually affordable. £199 ish from everywhere . . . . . .
I’ll direct you HERE for all the information you need – so get healthy and fit and . . . . whatever. Note – Whether anyone would need all the functions is of course highly debatable, but the miniaturization of the modules within such a small footprint case is pretty impressive. So whilst I mentioned the Tom Tom Golfer Watch in the text, it is of course hardly comparable. The Tom Tom is designed purely as a GPS Golfing function watch and as that it is ideal for the Golfer – and not all golfers are into the fitness – and I’m definitely one of them! Another Smart watch but this time connects to the phone operating systems of Android, Windows, including iPhone. Smart use of monochrome LCD displays means longer battery life at around 30 days – with charge point at rear. Classic watch look in a decent steel case at a sensible size, conventional strap/bracelet fitting and with a good clear non touch screen face. Operated by use of the conventional watch pushers – looks good too. Does the smart basics and is more costs effective than many of the big mainstream boys – so this is good news. Supposed to be available soon at around $349 or thereabouts and there’s also a square version, the “Meridian”. I prefer the strap version on the Luna above and the fact you can change to a different color strap can really show the watch off to best advantage. Definitely going in the right direction and good to see a non Apple product with such a sensible approach. Hopefully this is only the start.